A pattern and full tutorial for making this sweet bunny toy just in time to celebrate Easter or all things Spring. I will be extremely busy the next couple of weeks and I strongly doubt I will be able to blog much. So I've decided to bring home some posts I've written else in the last 2 years. Today I am bringing home one of my first posts from Babyccino. I was lucky enough to work the amazing ladies behind Babyccino and I am actually a little sad I won't be writing there anymore. They are no longer having contributors and so my journey ends. You should totally check out their blog and shop because it always full of awesomeness. I thought this post was still very current even if it was written 2 years ago. Enjoy! Magnote Toys... on my mind! Oh Hello! It's me!!! Yes I know I haven't been half as present as I would like to be around here. With all the work I did for Stylo and the launch last Monday- it has been crazy. I hope you all enjoyed and it got you into sewing for KCW this week! Oh and let's not forget I was in Utah most of last week at Alt Summit- the crazy cool and amazing blogging conference ( more on that soon I promise) and I hardly had time for anything. I am back full of ideas and goals, full of inspiration and ready to go go go. Watch out 2014, here I come! As I was away from the kids for 5 days, I figured a little gift was a must. Do you do this too? Bring a small gift back when you travel. I stayed at the luxurious Grand America and they have the best toy store, Joujou. Seriously, the store is beautifully curated and I could have bought everything. They had a really great boy selection as well, which is pretty hard to find. So I came across these Village Monsters- Gigo Blocks by Magnote. I just knew my son would love them- and he did. They are these fun building blocks and in each box you can create 2 sets of characters or you can mix and match the pieces to create your own. I fell in love with the quirky characters and they happen to be fun and easy to put together too. MissE loves them too, bonus! Perfect each kid ended up with a character of their own. And by the way you can find the GIGO BLOCKS - Monster Village on Amazon at a really good price (this is an affiliated link). "Show and tell... I tell you a little about me and show you something cool related to what I told you!" There are 5 bears in the collection, all unique in their own way- all handmade in Minneapolis with all the materials and time honored techniques. Each bear is special, wearing the cutest clothes and accessories, such as dresses and hand knit sweaters, the woven fabric is custom printed created just for the Polka Dot Club, no two outfits are ever the same. Also, the teddy bears each evolve and grow old in their own ways, which makes them even more unique. The fabric used to make the bears is quite special, they are all made from mohair and it's become very rare- only one manufacturer keeps on making it ( in Hungary if I'm not mistaken). These bears are like the ones our parents and we grew up with but yet with a modern touch, something that can be handed down from generation to genereation. How wonderful, a toy your children will be able to pass down to theirs. To think of it, maybe my children should be able to play with my little bear! Jen also created these lovely soft toys for babies to enjoy as a part of her new collection- a ball with the cutest bear face in the most adorable fabrics and colors. And everything is made with so much love. Now, her shop and website won't be up and running until a month or two, so I highly suggest you keep up with her process and all the wonderful things Jen is up too on her BLOG- a new favorite of mine. Also, if you like to sew like I do, you might want to check out her other little shop- it's filled with patterns and sewing supplies to make your own heirloom toys and she has a few for sale as well. I just bought a black and pink kit to make Mister M and Miss E a Maxwell Bear. I am so excited!!! Lastly, if you are looking for a cute easter craft to do with the kids, check out this really cute free pattern here! So if you want to be in the Polka Dot Club, like I am, and want to be the first to know about the new collection you can suscribe to the Newsletter. Thanks Jen for all the wonderful and inspiring work you do. I wish you all the best in the coming months- we can't wait to see it all come to life!!! My children seem to be obsessed with the Eiffel tower! Hummm, I wonder why? Maybe it that trip we took 2 years ago or perhaps it's because so much of our close family lives in Paris or is it telepathy? I certainly wished I lived in Paris! Miss E would like to climb it and Mister M just loves his "Tourne Eiffel", he has a few already. However, just the other night Miss E refused to take her Eiffel Tower t-shirt off to go to bed, as a plea bargain I promised the kids I would make them an Eiffel Tower pillow/ plush and so I did. I always keep a promise!!! On Miss E's bed... Minnie dreams of Paris now. On Mister M's bed, it's Superman who dreams of Paris. KIDSONROOF: A little too late!!! 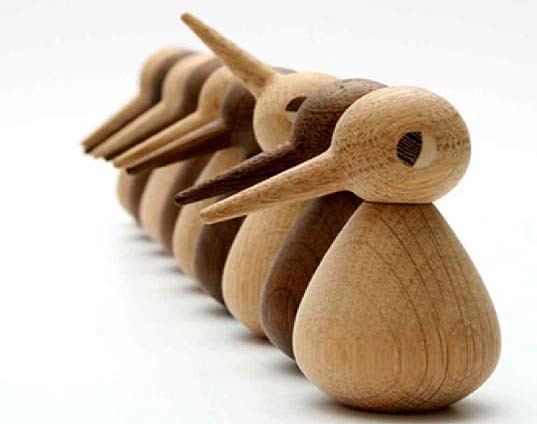 KIDSONROOF is a Dutch company that creates sustainable, playfully and aesthetically pleasing toys for kids. I first saw their Mobile doll house in Milk Magazine years ago, and have been a fan since. They had a few of the KIDSONROOF product, such as the Mobile Home (nature house with 8 rooms, an attic and spy holes), the Totem Pop out book ( pop out the cardboard pieces and make all the animals along with the sceneries), and they also had the the Cocorico Cooker ( a cardboard cooker ). Why didn't I realize this before... Museum Book Store are great places to shop for gifts! A little too late... Too bad my kids were spoiled over the holidays and there aren't any birthdays untill August... I can think of a few toys I would have gladly exchanged for some KIDSONROOF. But I might just be tempted to get something anyways since the Montreal Museum of Fine Arts book store is having a 20% off sale untill January 15th and keep the toys untill my kids behave exceptionally good and surprise them! If only... a toy gift guide! I was thinking of doing some gift guides to inspire you for the holidays, but ran out of time! And as I was looking at my kids toys over the weekend, to get an idea of what they might need, I came up with this idea... Here are the toys my kids love to play with and the version I wish they had! "My If Only... Toy Guide"
We love bowling, but I could really do without the Dora characters and they all fell apart anyways, we only have these two left! Doesn't make for much fun anymore... Look how lovely this wooden set is, it comes with colors or natural. By CHIGO. I found this stroller at the thrift store, and I can't believe it's still standing! But have you seen this wooden one? Too cute! It's by ELVES & ANGELS and you can buy at Nova. Mister M is is seriously into his letters and starting to spell... I love the idea of this wooden alphabet puzzle! Sure beats the foamy ones from the dollar store... I found this one at ENASCO. Plastic and Princesses, not my favorite combos!!! However anything vintage or vintage looking is my cup of tea! How lovely is this set by Nathalie L'Été? I love anything she does and I'm so happy for this collaboration with Vilac... you can find it at Open Ceremony. Ahh! The xylophone, a classic! The simpler the better in my opinion... However when you come across a really cool concept like PAT KIM's, then I'm all for it! How about some staking rhythm bands? I found these thanks to Kickcan & Conkers. The shopping cart... I had a hard time choosing between these two models: KAIKU DESIGN and PLANTOYS... there both fun and great for storing stuff too! So, I might be upgrading some of my kids toys... but is it more for me or them? My Virtual Advent Calendar... Let the countdown begin! With blogging comes new adventures! Advent calendars are kind of new to me... My mother is Jewish and my father is Protestant, however my parents got divorced when I was fairly young and since we lived primarily with my mom, my Lil Sis and I were brought up mostly with the Jewish traditions. However, every year we celebrated Christmas with my mom, my dad, the neighbors and anyone who had nowhere to go. We would decorate a tree, have a big family and friends dinner and exchange gifts. On a couple of occasion, I can remember my mom getting us a chocolate advent calendar, but not until a few weeks ago did I even know what they were called! Now, I find out some children got little gifts every day. What? So since this isn't a tradition I am used to and I didn't make one for my kids, I thought why not make a virtual advent calendar! Every day up until Christmas I will share with you what I would have put in Mister M's and Miss E's calendar, with all the items being under 10€... Is that too high? We'll just pretend we live in a perfect world, where money is no object and shipping rates don't apply!!! For Mister M: the gliding bird. For Miss E: the paper fan. Do you live in a small apartment in the city? I do, it's not crazy small but it's not big either. Each kid has his and her room, we have a connected dining and living room, a smallish kitchen, it's not big enough for a table, and we have a tiny bathroom. That being said our kids play in every room of the apartment, we have toys everywhere! Do I wish to live in the Suburbs? Never say never, right? How about, I would rather not, unless I was by the beach in some exotic country with unlimited access to a city near by and the Internet!!! I'm a city girl, always have been! 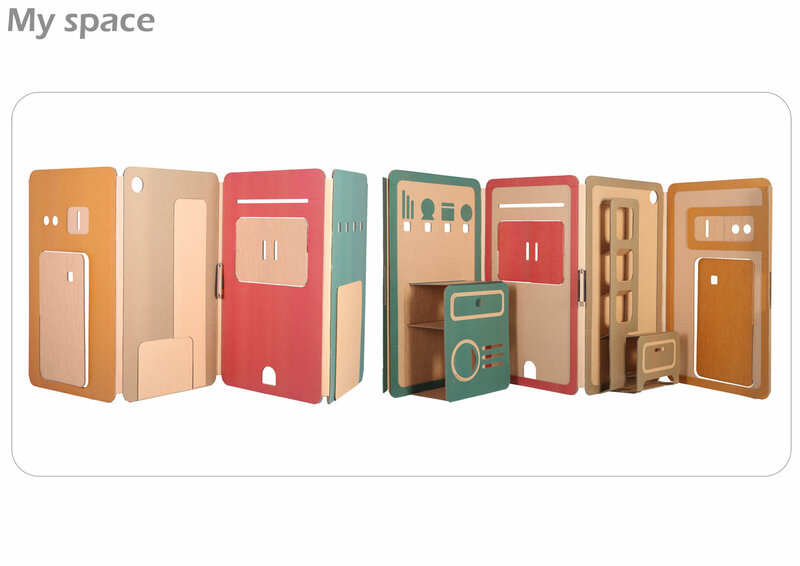 So you can imagine my excitement when I saw MY SPACE a cardboard folding play area by designer Liya Mairson. 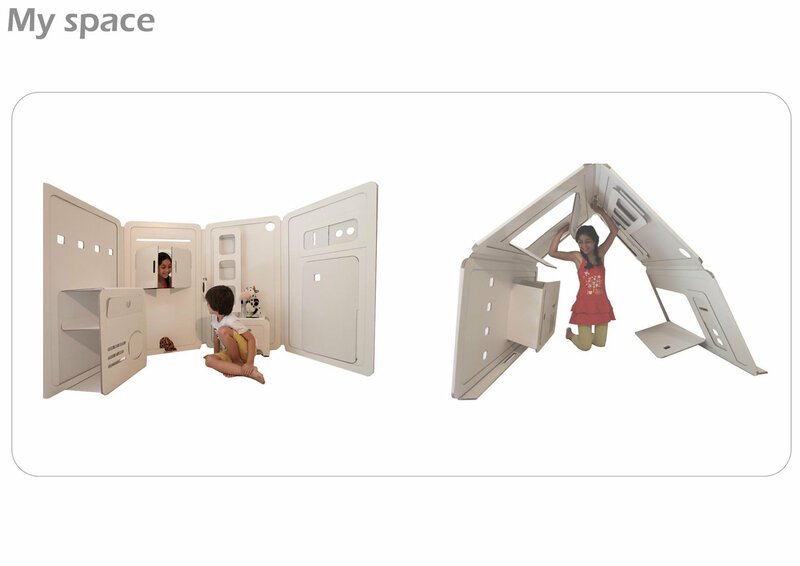 My Space is intended for children from age 3-6, although i could see my 2 year old have a blast! 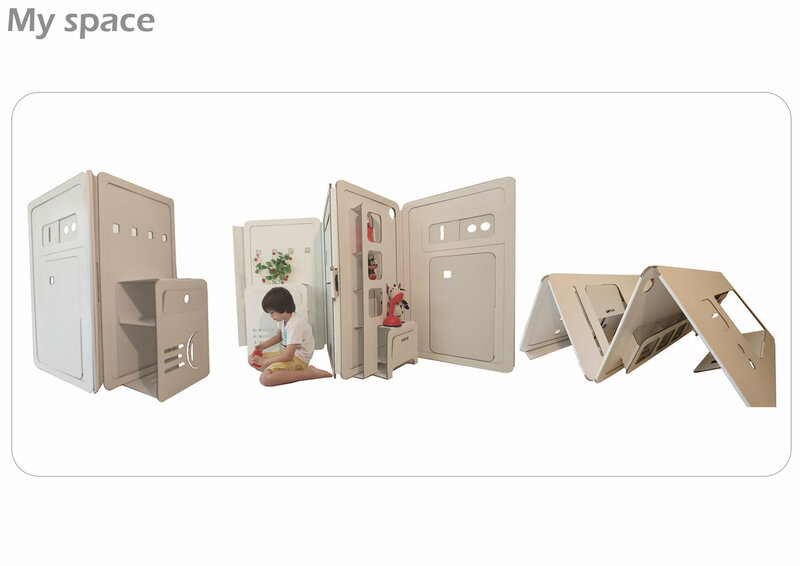 It's light weight and easy enough for a kid to manipulate on his own, it folds up and is easy to store away under bed or behind a door. It can be played with in many different configurations, letting the imagination lead the way. It's also entirely recyclable. NICE. In my opinion this is the ultimate urban playroom. Now why isn't it being produced yet? I was so bummed out when I found out it was in the development stages and was going to be produced shortly... Soon enough I hope, before Mister M and Miss E outgrow the playhouse phase and I'm pretty sure the back of one door isn't filled up yet! Look how cute it is with colors! You could customize your white one as well, let the kids paint or draw on their walls... I wonder how much My Space will go for? I'll keep you updated. 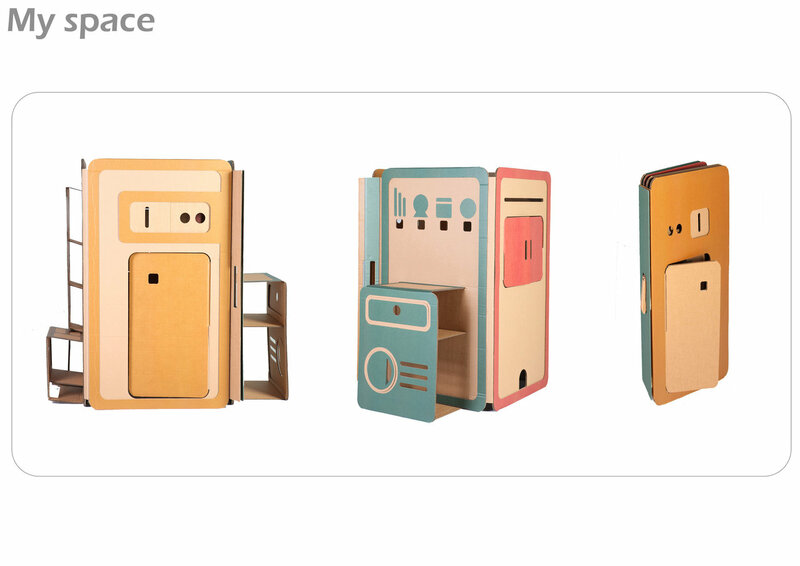 Liya Mairson has some interesting products on her portfolio website as well, I really enjoyed her DIY section... I might try a thing or two!